"HIGHWAY PATROLMAN is maverick director Alex Cox's finest film to date and represents his best work since his terrific debut feature, the funky, surreal 1984 REPO MAN. 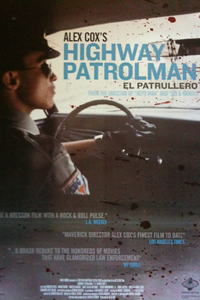 Released in the US in 1994, HIGHWAY PATROLMAN, in Spanish with English subtitles, opens just the way one would expect of Cox -- with a darkly satirical take on the subject, an idealistic young Mexican's training at the National Highway Patrol Academy in Mexico City. "But the British-born Cox and his producer-screenwriter, Lorenzo O'Brien, a Peruvian raised in Mexico, gradually get more serious once their wiry, wistful hero (Roberto Sosa) takes up his first assignment in a remote town in Durango. "In its way, HIGHWAY PATROLMAN is a coming-of-age film, both for its hero and for Cox himself. It's also a beautiful, gritty film, shot by Miguel Garzon and scored evocatively by Zander Schloss, steeped in the atmosphere of vast, desert-like vistas slashed by highways sizzling in the heat."